"Fighting Back Against the D&O Personal Profit Exclusion"
Few provisions in Directors and Officers (“D&O”) insurance policies have given rise to more litigation than the personal profit exclusion. For those unfamiliar, the provision generally excludes coverage for claims arising from or based upon the gaining of any personal profit, advantage or remuneration to which an insured was not legally entitled. "Risk Transfer Nightmares — Addressing and Avoiding Potentially Disastrous Traps"
Indemnity and insurance arrangements are prevalent nowadays in virtually every business setting. The goal is simple, to shift potential liability and loss from one party to a transaction to the other by way of an indemnity, and to pass that risk through to insurance. 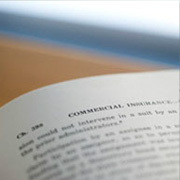 In practice, achieving the simple goal of insuring risks through an indemnity and insurance is mired with legal complexities. Worse yet, the myriad of legal issues involved typically arise only after a claim is made, and the resulting implications can be downright alarming. "CFPB - A New Federal Agency Is On The Prowl"
No worries, your business insurance may apply. The new federal agency, the Consumer Financial Protection Bureau ("CFPB"), is rapidly ramping up its enforcement efforts and is coming after banks and mortgage, credit card, and consumer financial service companies. Its reach is long and its ambition unlimited. There is no doubt that the CFPB intends to place itself within the ranks of the Securities and Exchange Commission ("SEC"), the Federal Trade Commission, and the state attorney generals around the country. That's the bad news. The good news is that there may be insurance coverage for responding to regulatory and legal actions initiated by the CFPB. "Superstorm Sandy - The Inconvenient Truth About Business Insurance Claims"
Superstorm Sandy left a trail of destruction from Virginia to Massachusetts, wreaking havoc on hundreds of thousands of businesses and millions of people. Although the New York City metropolitan area was hardest hit, an untold number of businesses outside that area are also suffering from storm-related financial losses. Given the breath of coverage provided under typical property damage and business interruption insurance policies, it makes sense for impacted businesses to evaluate their insurance coverage, and in situations where coverage is provided, zealously pursue that coverage.